A beer revolution has taken Boulder by storm in recent years, with new breweries popping up all over town. And our local thirst reflects a national trend: According to the Brewers Association, the number of breweries in the United States increased 19 percent in 2014. Colorado especially loves craft beer, made by small, independent brewers that produce no more than 6 million barrels a year. Our state ranks third for number of craft breweries (235) and craft breweries per capita (6.1). Boulder is helping boost the statistics, with more than 20 breweries serving a dizzying array of beer. What better way to sample a few than to pedal around on two wheels? The biggest challenge is how to choose. Fear not, though: RootsRated has put together an approximately 10-mile route that brings you to nine of Boulder’s finest (not that we're recommending you do all of these in one go). Bottoms up! Start by heading east on the Boulder Creek Path, past 30th St. Just after the cattail-rimmed ponds of the University of Colorado Research Park, you’ll cross under Arapahoe Ave. 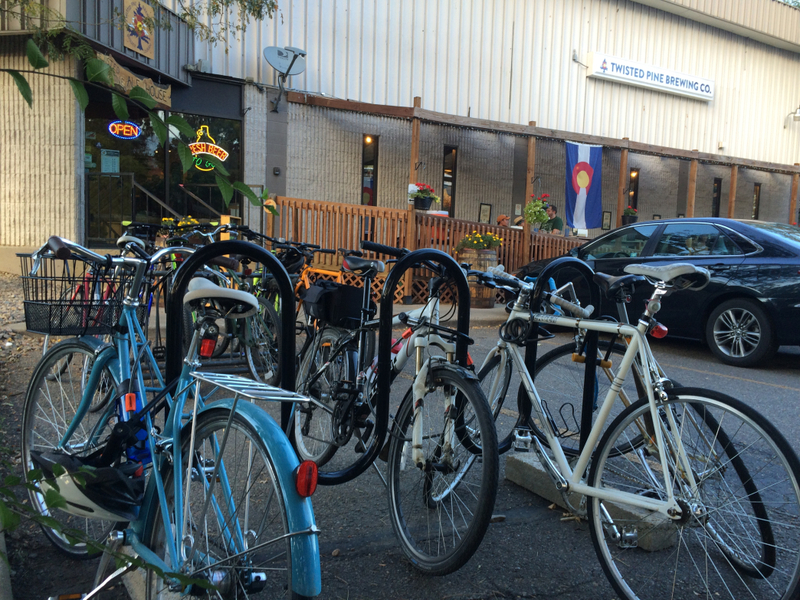 Immediately after this, exit the bike path onto Arapahoe and ride the wide sidewalk heading west. You’ll soon see FATE on your right, just before 38th St. 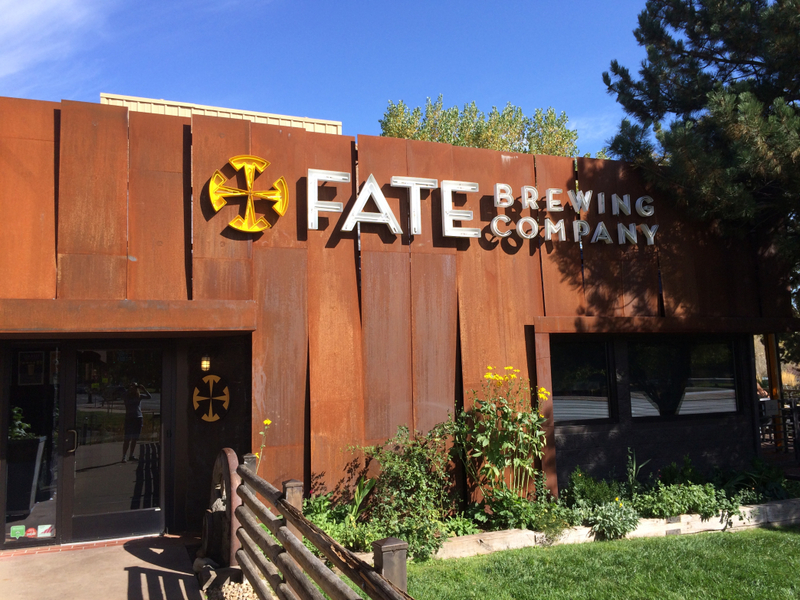 FATE is a great place to start your tour with a pint and some grub. This bustling brewery and restaurant serves more than a dozen of its own beers, and has a generous selection of guest taps. Try the award-winning Moirai IPA if you’re a hops fan. Grab a table on the large patio if the weather is nice and dig into some shared pub plates, or choose from a broad menu of sandwiches, salads, and burgers. Roll on: When your glass is empty, hop back on your bike and retrace your steps (or tire tracks) to the bike path, then head east. Just after crossing under Foothills, bang a right to get back to Arapahoe and head east on the sidewalk path. Cross Arapahoe at the light at Commerce/Eisenhower, then ride a bit farther east until you reach the small shopping center on the right. BRU is at the west end. The brewmaster at BRU is also a chef, with culinary chops that shine through in his carbonated creations. His Citrum IPA, brewed with fresh lemon zest and juniper, is a favorite. Other creative concoctions include Sasquatch, a roasted pumpkin porter with molasses and spices, and Belux, a Belgian style pale ale with lemongrass and ginger. 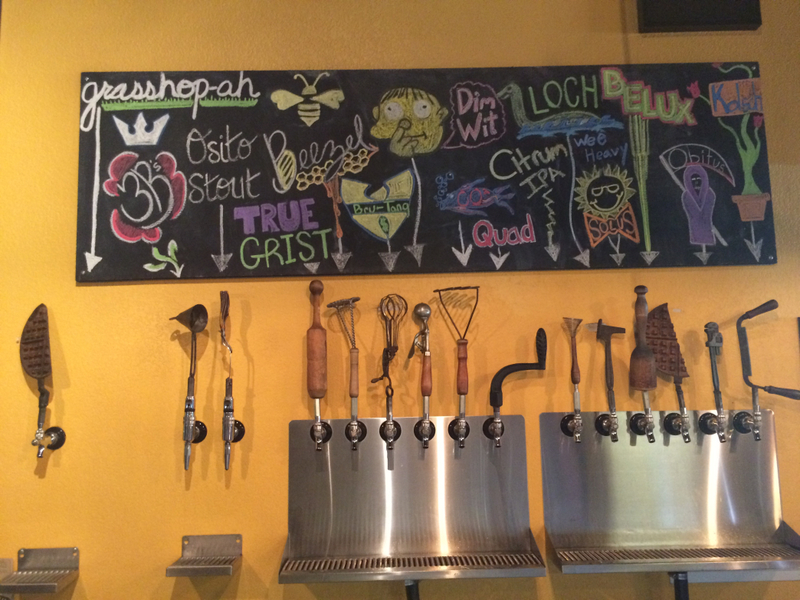 The theme continues in the tap handles, which are antique cooking tools. 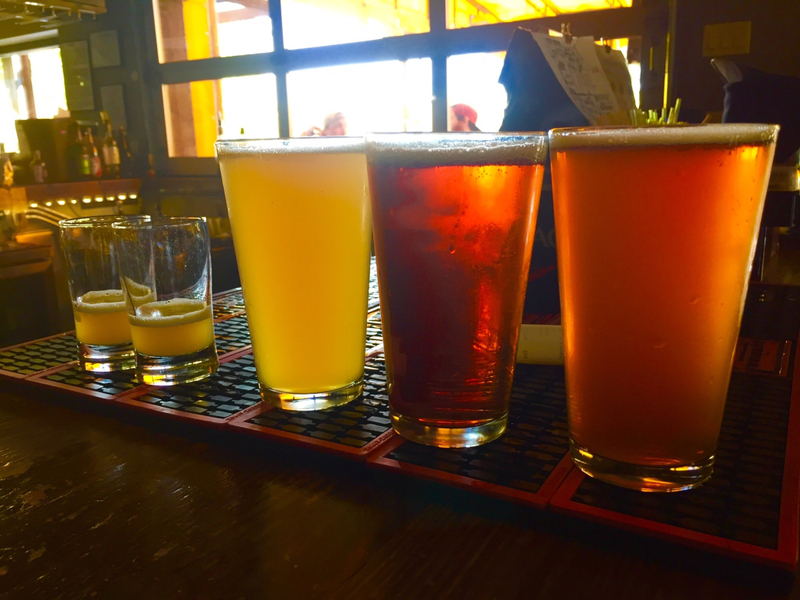 Select from 9-, 16-, and 22-ounce pours, or opt for a flight of five 4-ounce beers. BRU also serves delicious food, so fuel up now if you’re hungry. Your next three stops offer only modest snacks. Roll on: When you’re ready to roll, head east on Arapahoe, turn left on 55th, then immediately left into the first shopping center (5440-5490 Conestoga Court). Wrap around the building on the right and find Wild Woods in the corner. 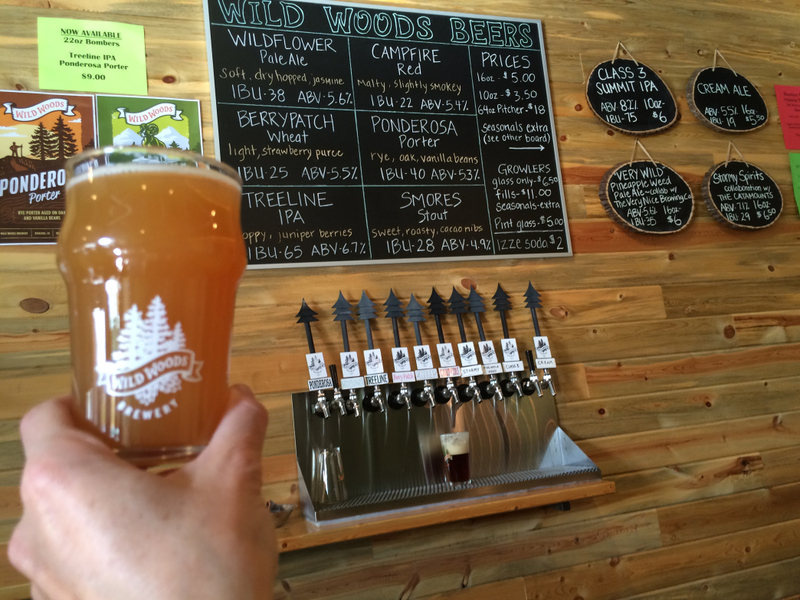 Wild Woods opened in 2012, crafting beer inspired by the outdoors. Their creations are available only in the taproom and some local restaurants and bars. Choose from six regular beers plus a rotating selection of creative seasonals. Go soon so you can sample the “Very Wild Pineapple Weed Pale Ale” before it runs out. If you fall in love with one of the brews, grab a growler to go. (Just be careful not to fall off your bike.) Keep in mind that the bar is closed Sundays and Mondays. 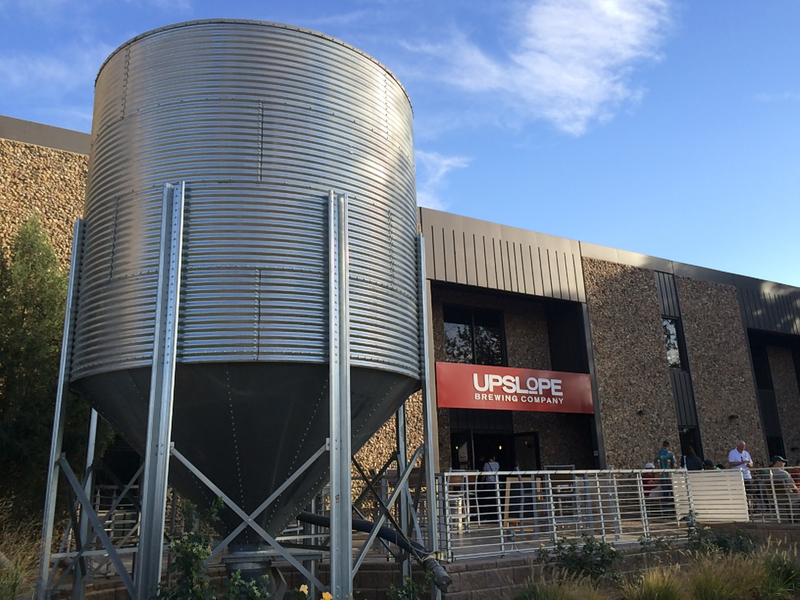 The Upslope taproom buzzes with activity. Sidle up to the long bar to sample the brewery’s well-known varieties, as well as special limited release and single batch brews. If the view through the large windows to the brewing room catches your eye, stay for a tour, which are offered on weekends starting at 3 pm. There’s no food here, but sometimes a food truck parks out front. Roll on: Pedal back to the bike path and head west. Enjoy the Flatiron views as you roll past the meandering creek and wetland, but keep an eye out for the next turn: a right on the Goose Creek Greenway Trail. Follow this to the junction with the Wonderland Creek Greenway, then take a left to stay on the Goose Creek Greenway Trail. Dodge the prairie dogs, then take your first exit on the left, which dumps you at 49th and Pearl. Follow 49th and look for 2516 on the left, marked by a big tan sign with maroon company names. 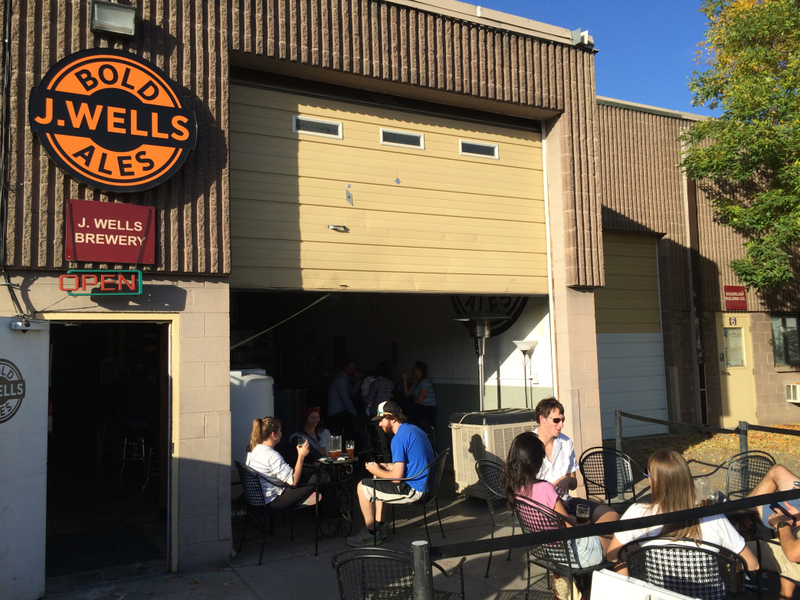 J Wells is in a small industrial space with a big garage door that rolls opens to a small patio. Specializing in IPA, pale ale, and British bitter, J Wells says it’s selling beer faster than they can make it. They brew only small batches and pour certain beers in small glasses to make them last longer, with constantly changing offerings. Pleasant Gentleman, an IPA, is the most popular pour. Chocolate Milk Stout is another regular. Snack options are slim, so don’t plan on food here. Roll on: Head back to the bike path and pedal west. When you get to 47th St., it’s a little tricky. Turn right on the bike path, then left through the underpass to cross Foothills. Snake up the switchbacks, cross the bridge, and bear right to keep heading west on the Goose Creek Greenway Trail. Take a right at the first exit and enter the business park, keeping Community Cycles on your left. Turn right onto the one-way Wilderness Place (note the large steel barrel), then pedal around to the entrance to Boulder Beer on the left. 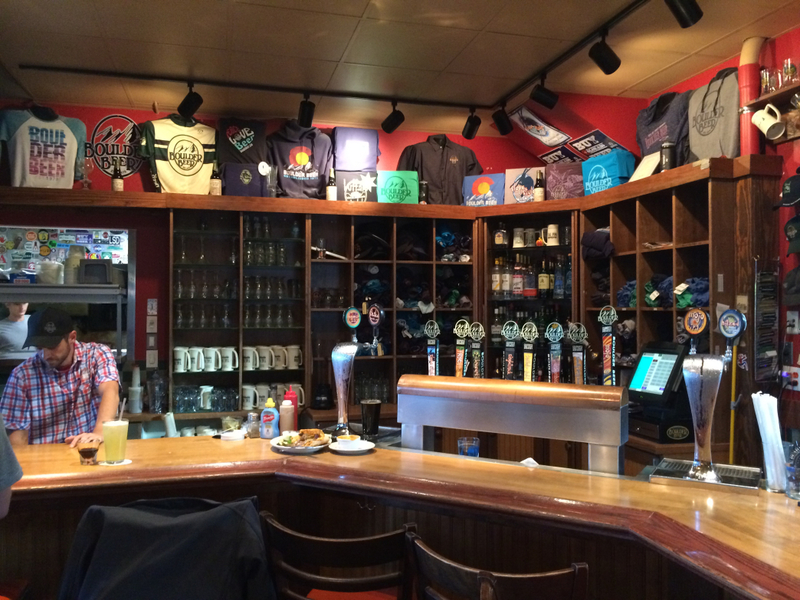 Boulder Beer was Colorado’s first craft brewery. It’s known for local favorites like Buffalo Gold, Hazed & Infused, and Mojo IPA. The pub pours year-round beers as well as seasonal and limited releases, and also serves a full food menu, with hangover-prevention favorites like potato skins, nachos, burgers, and fish and chips. Chill for a while on the large outdoor patio, and consider sticking around for a brewery tour (weekdays at 2:00; Saturdays at 2:00 and 4:00). There’s live music on the patio from 5-9 pm on Saturdays from May to September; the brewery is closed on Sundays. Roll on: Exit the parking lot on the opposite side and turn left to complete a circle around the building. Return to the bike path and turn left to go back toward Foothills. At Foothills, turn right before you cross the bridge and follow the path to Pearl. Cross at the light and turn right on the bike path on the south side of the road. Take your first left onto Frontier, then turn right at the end of the building that says 3550 on the corner. The entrance to Sanitas is at the end of the building on the right. 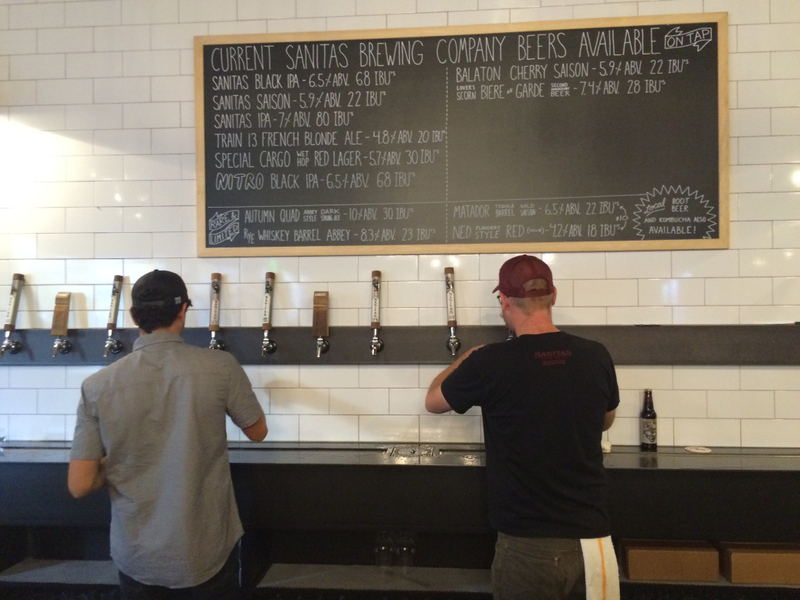 Just two years old, Sanitas is becoming a hip place to grab a beer after work—especially among folks from Scarpa, La Sportiva, and Montbell, which are in the same office park. The large, open taproom is both rustic and modern, with big garage doors that open to a huge patio. Peruse the selection of a dozen or so beers on tap. The Black IPA is the most popular. The Saison Reposado—aged in tequila barrels with oranges, lemons, and limes—wins the creativity award. If you need a nibble, grab a taco from the McDevitt Taco Supply cart outside. Roll on: Head back to Pearl and turn left (west). Just after crossing the train tracks, take a left on the multi-use path and follow it around the apartment building to where it ends. Cross the bridge and turn left to go down the alley next to the Fastenal building. Turn right on 32nd and follow it to Walnut. You’ll see wooden barrels outside Twisted Pine on the left. 8. Twisted Pine Brewing Co.
Brewing in Boulder since 1995, Twisted Pine has been around longer than most. The taproom has been open since 2003 and serves more than 20 Twisted Pine beers. Down a Hop Zealot if you’re on an IPA-themed tour. Flights are available if you can’t decide. There’s also a full food menu, with pizzas, sandwiches, and salads, plus beer-infused ice cream for dessert. If you want to drink quickly, get the chicken chile—it’s spicy hot. Saturdays feature live music from 7-9 pm, and big screens show sports on game days. Roll on: If you’re not too twisted by now, blend your tour into a night on the town. Roll west on Walnut all the way to 16th, then turn right to get to Pearl. Turn left on Pearl and pedal to Mountain Sun, which is on the right. 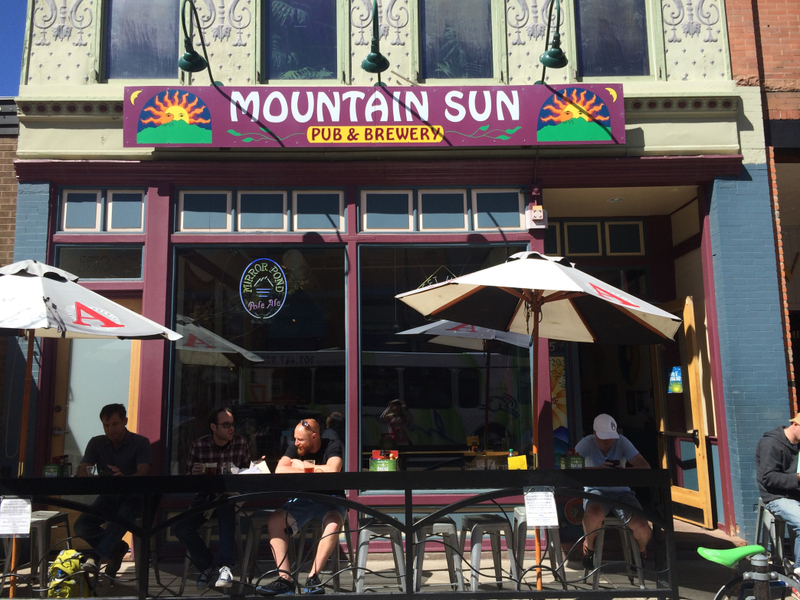 The hippies at Mountain Sun have been brewing beer since 1993. In the shadow of tie-dyes and tapestries, quaff a pint of Colorado Kind Ale or choose from a huge selection of other options. Mountain Sun makes more than 75 different beers throughout the year. If the munchies are setting in, nosh on something from the menu of affordable pub food. Make sure you have cash—they don’t accept credit cards. There’s an ATM on site if you fall short. Roll on: Depending on how festive you’ve been, you might want to park your bike and take an Uber home. And follow the “Rule of Twos” before bed: two glasses of water, two Advil, and two pieces of toast.